The next great leap in the computing world is expected to be quantum technology and, as part of their investment in research into quantum information technology, Microsoft is collaborating with Professor Charles Marcus, head of the Center for Quantum Devices (QDev) at the Niels Bohr Institute at the University of Copenhagen. 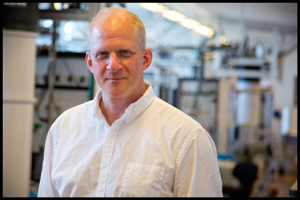 s leading researchers in quantum electronics and has built an international research center at the Niels Bohr Institute. 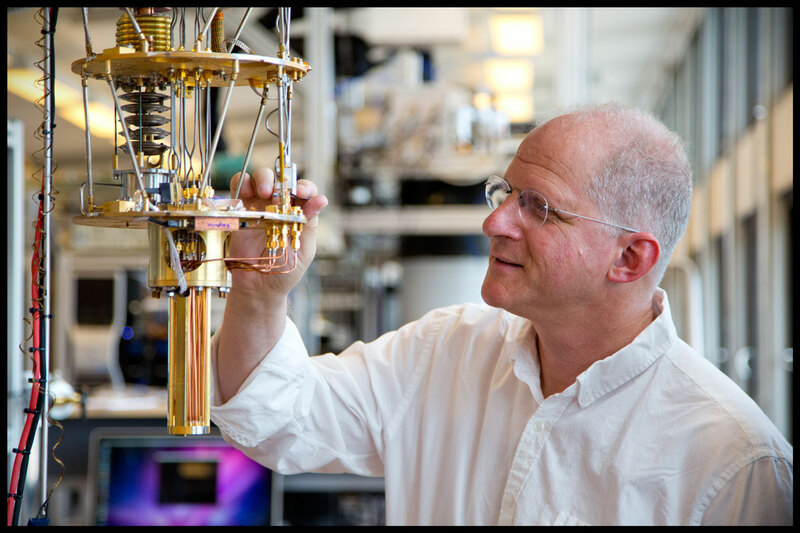 Charles Marcus is one of the world’s leading researchers in quantum electronics and has built an international research center at the Niels Bohr Institute. 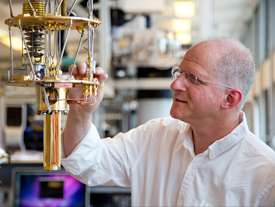 The base for the research collaboration between Microsoft and the Center for Quantum Devices, called Station Q–Copenhagen, aims to realise quantum information. The Niels Bohr Institute has been selected by Microsoft as one of the few places in the world to participate in the project. “This is a fantastic development for QDev and the Niels Bohr Institute. Microsoft is collaborating with a team of the world’s leading researchers in the field and the basic physics is already a focus area in the QDev center,” explains center head Charles Marcus, who will coordinate the collaboration between Microsoft and QDev. Where calculations in conventional computers are based on bits consisting of either 0s or 1s, quantum information can be based on so-called quantum bits (qubits), that is to say electrons whose spin position faces either up or down and thus constituting the 0s and 1s. In the quantum world the 0 and 1 positions can exist simultaneously, allowing a kind of parallel processing, which means that large amounts of calculations can by performed by the machine simultaneously. This could make quantum computers much faster than conventional computers. 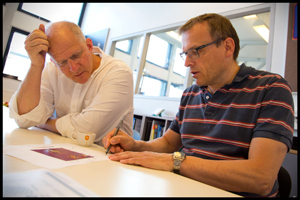 The research in the Center for Quantum Devices (QDev) at the Niels Bohr Institute is at the forefront of the handling of quantum information including theoretical, led by Karsten Flensberg (right), material synthesis, led by Jesper Nygård and experimental measurements, led by Charles Marcus (left). Microsoft Corporation is interested in quantum information and is supporting a team of physicists, mathematicians and computer scientists. This team, called Station Q, located at the University of California, Santa Barbara and in Microsoft’s headquarters in Redmond, Washington, is actively engaged in research in a certain aspect of quantum information based on topological particles called Majoranas, which exist in certain materials. The idea is that by controlling these particles electrically, they can be braided and result in interactions that produce information – quantum information. The research in the Center for Quantum Devices (QDev) at the Niels Bohr Institute is at the forefront of the handling of quantum information including theoretical (led by Karsten Flensberg), material synthesis (led by Jesper Nygård) and experimental measurements (led by Charles Marcus). The centre has also developed a method for producing nanowires with unique properties. The nanowires will act as one-dimensional conductors, where you can control the Marjorana particles with quantum information. The base for the research collaboration between Microsoft and the Center for Quantum Devices, called Station Q–Copenhagen, aims to realise quantum information. Quantum information is based on these exotic and strange particles, Marjoranas, which physicists describe as quasiparticles. The particles only exist in two dimensions and not in nature’s usual three dimensions – a phenomenon that occurs in a complicated microscopic system. These quasiparticles are to be the building blocks of the new supercomputers. He adds: “It is fantastic that Microsoft recognises the value of basic research and especially great that they have chosen our center as one of the few to be part of the effort. And it is particularly fitting that Copenhagen – the city that Niels Bohr was most associated with during the first century of quantum mechanics, can also play a role in the second century’s revolutions in quantum technology,” muses Charles Marcus.